The science of ichnology, data-driven pet-care, and a bit of back-of-the-envelope calculations leads me to believe my little hedgehog is a world-class champion marathoner. Ichnology is a fascinating field of investigating creatures by the traces they leave behind. We've previously looked at how the field applies to fossilized footprints millions of years old, but it also applies to fresh footprints made from creatures still alive today. How Do You Determine the Age of a Footprint? You know the concept from movies — legendary trackers looking at a few footprints and a bent twig to extract the vital statistics of a creature who stomped past. The real science is less flashy, but just as cool: combine knowledge of animal motion and biomechanics to investigate the tracks that they leave behind. As an irrepressible scientist, I couldn't help but apply the field of study to my spiky little friend. I have a pet hedgehog, a small ball of curmudgeonly adorableness. 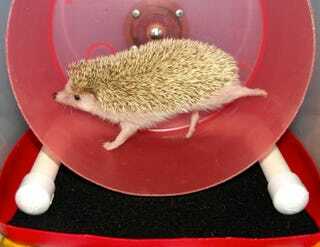 Despite having ample freedom to roam his territory, he repeatedly hops onto his wheel for a nightly dash. Of course that means I just had to rig a bicycle odometer on to his wheel to find out how far he runs! Excuse the click-baiting phrasing, but what I learned honestly surprised me. While the True Facts tease of hedgehogs having a roaming territory of 135 miles in a straight line is absurd, the reality sounds almost as implausible. My little hedgehog covers anything from 3 to 13 kilometers in just a few hours during his nightly jogs. From polling other hedgehog-caretakers, his activity rate is totally normal. That's a respectable distance to cover for any creature, it's even more impressive in the context of a hedgehog's tiny inch-long legs. This is where science and order-of-magnitude calculations gets useful. Take a slo-mo look at someone else's small spiky friend, Lulu, running on her wheel. Her left and right forelimbs alternate, which classifies her motion as a symmetrical gait. The portion of time each foot is on the ground is the duty factor, in this instance indicating Lulu is running her tiny heart out. My small friend looks the same when he runs, although he's more camera-shy about the process. The stride length of a quadrupedal mammals is proportional to the acetabular distance, which is the length from hip to shoulder. The scaling factor is somewhere between 1.1 and 1.25. I can divide the total distance he covers by his stride length to determine how many pitter-pattering footsteps little hedgehog covers in a night. Last December, my little hedgehog ran 6.7 kilometers in 2.75 hours. This was a fairly typical night for him — not his laziest evening, but no where near his epic all-nighters. The distance from his hip to shoulder is 7 centimeters, so after converting units that's (6700 m / 1.25 x 0.07 m) = 76,571 footsteps. For a human, it's about 2,000 footsteps per mile, so 1,250 footsteps per kilometer. 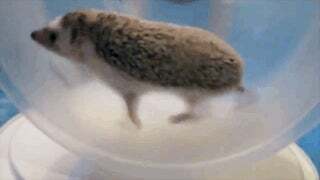 If I were to match my hedgehog step-for-step, I'd need to run just under 61 kilometers. I can promise you, I have never managed that kind of distance. Most days I can't even compete on straight-distance to match my spiky friend kilometer-for-kilometer, as multi-kilometer strolls are not part of my daily activity. Marathons are 42.195 kilometers (26.22 miles) long, with the current world records set at 2 hours, 3 minutes for men or 2 hours, 15 minutes for women. Scaled for size to cover an equivalent number of footsteps, my hedgehog ran just under 1.5 marathons, and for a single marathon, crossed the line at 1 hour, 54 minutes, a record-holding pace. That is seriously impressive. Sleep soundly, little friend, you deserve it. Hedgehogs are unusual pets with a lot of attitude. If you're tempted to befriend a small ball of spikes, please read this guide first. Although they're marathoners, they're not very graceful. They absolutely require an extra-large solid-surfaced wheel to avoid breaking those quick-moving legs. This article is adopted from a writeup on GeoMika. For more mathematical fun, here's an investigation on the probability of seeing a meteorite while skydiving. For more creative ichnology, have you considered the tracks left by peeps? What Are the Odds That You Might See a Meteoroid While Skydiving?